There may come a time when you might want to shrink tempdb because it has become too large. There are a few ways you can do this and I have listed them below but please read to the end of the post before making a decision on which way you want to approach this. There is an important note at the end of the post. So first, we’ll look at the configuration on my server. The syntax is as follows and the operation does not require a restart of the sql server service. Don’t try and increase filesizes in tempdb using this command because you will see an error. In this example, the attempt was to increase to 50Mb. Cannot shrink file ‘1’ in database ‘tempdb’ to 6400 pages as it only contains 640 pages. As in my post about moving tempdb, you can use the ALTER DATABASE command to perform a tempdb resize. The following script will resize both the log and data file to be 100Mb. 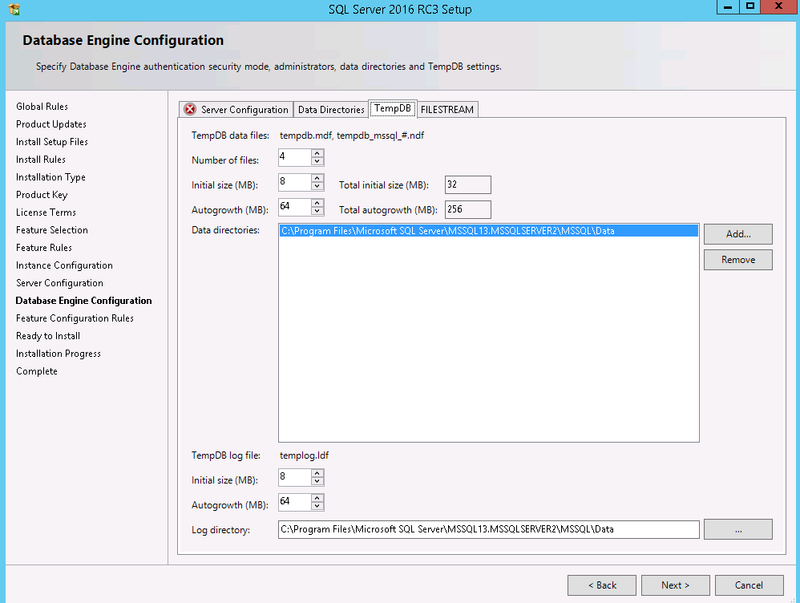 This operation requires a SQL Server service restart once the tempdb configuration has been set by ALTER DATABASE. You can also use Management Studio to resize Tempdb and perform shrink operations by right mouse clicking the tempdb database and choosing Tasks->Shrink. To resize tempdb, you can set the file sizes by right mouse clicking the tempdb and choosing Properties->Files and setting the sizes there. Note that with both the ALTER DATABASE and management studio methods, you cannot resize a tempdb file to a particular size if the data contained in the file exceed the size that you are trying to size to. It is documented in this Microsoft article that it can cause consistency errors in the TempDB database if you perform a shrink operation while the database is in use so please read this carefully and consider whether you can shrink the database by other means, i.e restarting the SQL Server instance which will create a brand new copy of TempDB releasing the disk space. I sometimes get asked about why tempdb won’t shrink when using one of the methods which does not involve a SQL Server service restart. Microsoft recommends that if possible, shrinking of tempdb should be done either in single user mode or when there is no current tempdb activity. I have extracted the quote below from the article that is linked to in the previous section. SQL Server TempDb – what’s it for? SQL Server TempDB is a system database, automatically created when you install SQL Server. So what is it used for? Well a few things actually but first I have to tell you that Microsoft didn’t name tempdb because they couldn’t think of a suitable name. It is a temporary database which is re-created every time the SQL Server service is started and at a higher level, it could be considered to be the page file for sql server. When you execute the create table script, the temporary table will be created in tempdb. Other objects created in tempdb would be temporary tables, temporary stored procedures, table variables, cursors and internal objects created by the database engine. These would typically be work tables created to store intermediate result sets for spools or sorting. So you might want to create an index using tempdb and use SORT_IN_TEMPDB in your CREATE INDEX statement to store those result sets. You would typically do this because you want to take the load off the main database files whilst the index is being created and hope to speed up the creation of the index in the process. There are disk space considerations to bear in mind with that though and I’ll discuss that in another post. Finally, its other function is to maintain multiple versions of rows. SQL Server TempDB – what can’t you do?